The challenge is to make communities safer, and this book is about the key issues which those working in and with communities now face in trying to meet this challenge. It argues that a balanced and proportionate response is needed to anti-social behaviour and crime - one that offers strategies for prevention, intervention, support and enforcement. Fifteen thought-provoking chapters address the themes of ‘disorder and regeneration’, the ‘policing of crime and disorder’, ‘service provider approaches to safe communities’ and ‘social inclusion and community safety’. 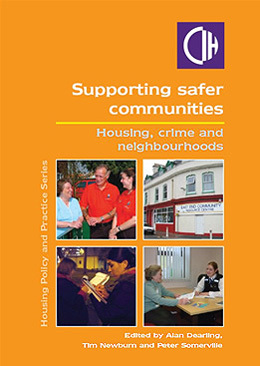 The authors explore the importance of working with residents in community safety responses and examine how staff in housing, social work, police and education can overcome barriers by working in partnership. They recognise also that we need robust housing management practices that respond to tenants’ support needs. Housing professionals will find examples of effective strategies for dealing with the wide range of anti-social behaviour and criminality that can exist in communities today. They will also have access to the policy debate about how we tackle crime and fear of crime, and the relevance of and the questions that need to be asked about the government’s ‘Respect’ agenda. The book is also highly relevant to all those working with community groups or in neighbourhood regeneration, in areas where crime, fear of crime or anti-social behaviour are on the agenda. Alan Dearling is a full-time writer and researcher who has published over 30 books, including Making a difference – practice and planning in working with young people in community safety and crime prevention programmes for Russell House Publishing. Tim Newburn is Professor of Criminology and Social Policy and Director of the Mannheim Centre for Criminology at the London School of Economics. His other recent books are: Plural Policing (Routledge, 2006) and Policy Transfer and Criminal Justice (Open University Press, 2007). Peter Somerville is professor of social policy and head of the Policy Studies Research Centre at the University of Lincoln. His most recent book was Housing and Social Policy published by Routledge in 2005. Price: £25, available from Publications Office, Chartered Institute of Housing, Octavia House, Westwood Way, Coventry CV4 8JP.